– In the largest urban areas or in areas with the fastest growing population? 1) Ground based ocean temperature data matches fairly the UAH TLT ocean data – but the ground based land temperature has a warmer trend than UAH TLT land data. I argued that this extra heat in the ground based land data might originate from UHI, adjustments and siting problems. 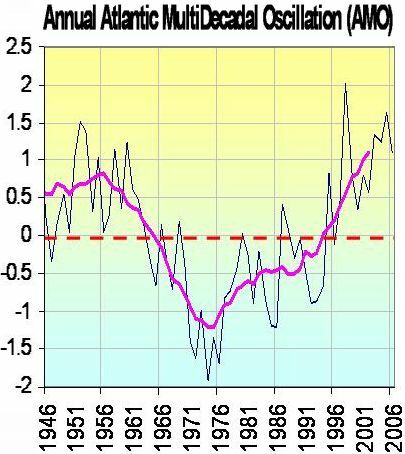 2) The UAH TLT land vs ocean data has a rather similar trend as if they seek an equilibrium in temperatures. I mentioned the problem for ground based data that the land data vs. ocean data has an ever larger difference so far not explained. Point 1) was intensely debated which as always brings about more knowledge. Especially one argument used based on expectations to where geographically UHI should be seen strong in the satellite years 1979-2010 has been rewarding to examine closer. Bob Tisdale has made a very useful grid-wise compare of TLT UAH data vs GISS data worldwide which enables further studies on point 1). This could shed light on the UHI question: If Ground based GISS data warms faster than UAH TLT in areas where we expect UHI, then perhaps a UHI signature is confirmed. And UAH data in compare with GISS data an indicator of UHI. Bob finds no significant difference between USA temperatures for UAH vs. GISS ground based for 1979-2009. If one expects that there should be UHI in USA in this period, then according to my suggestion, we should have seen GISS ground based warming faster than UAH USA temperatures. However, for example McIntyres calculation of Petersons USA city-vs-rural data shows no UHI 1979-2009 for USA either… So perhaps we should not expect UHI 1979-2009 for USA? “NoUHI ” : Means that GISS ground based data often from cities and airports has a rather simlar warming trend compared to the TLT UAH (- sometimes just a little extra warm in GISS data). “UHI” : Means that GISS ground based temperature trend is significantly warmer than UAH TLT and thus contains something that cannot be detected by satellite, we call it UHI for now. 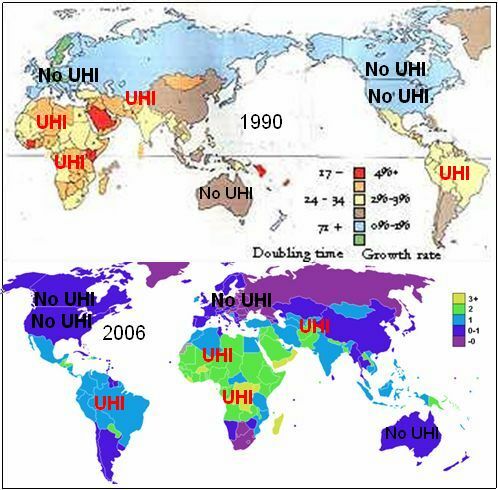 But before throwing data out in the drain and before skipping the UHI idea, do we actually know where geographically we should expect UHI 1979-2009? Lets examine it. Thomas Karls data suggests that increase in population number for cities already large has much less UHI effect generally than a similar increase in population number for a small town. That is, UHI should be expected NOT necessarily in the biggest urban areas of the world, BUT in the areas with biggest relative population growth. 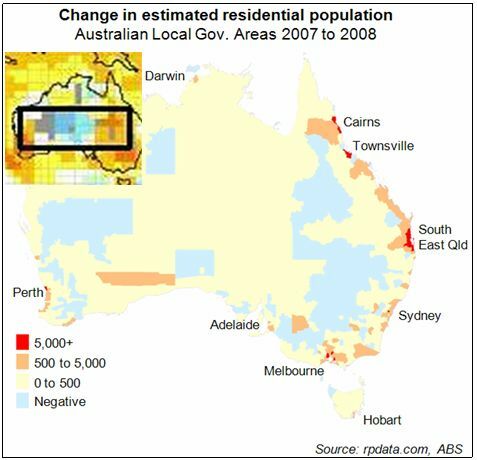 So where are the areas with the biggest relative population growth? 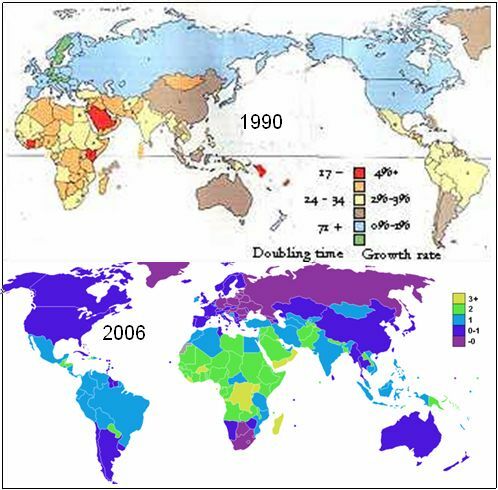 Population growth rate: I found 2 such statistics from the 1979-2009 period, upper effective in 1990 and the lower in 2006. Result: North America, Europe and Australia has the lowest growth while Africa incl Sahara, and Brazil and more countries in South America and also large parts of Asia has the biggest population growth rate. – The match with the relative population growth 1990 and 2006 is perhaps better than we could have demanded since many factors hypothetically could have made the picture blurry. Bob Tisdales data seems to confirm that the divergence in GISS ground based data compared to UAH TLT could possibly be due to UHI, at least partly. At least if we expect UHI mostly from areas not just with a large Urban fraction but rather UHI mostly from areas with the fastes relative growth. And this sounds to me reasonable. But since most Russians live in the Euopean part where population has been declining, the national population numbers are not useful to justify the warmer GISS data compared to UAH over Siberia. So, population numbers suggests UHI over Siberia, but not the European part of Russia. Then, my “UHI” over southern asia: The Tisdale Asia covers Siberia and southern Asia, but the extra heat in GISS compared to UAH is larger for this Asia area than just the Siverian area. Therefore, the Southern Asiea has the largest divergence GISS vs. UAH. –> I will within a short time present a new article without any reference to Bob Tisdales results, but in stead a much more detailed analysis where also regional population data from all the wolrds largest countries will be used in addition to national population data. UAH ocean temperatures , UAH land temperatures and the most often used SST´s has similar warming trend. The ground based land temperature trends have warmer trends. 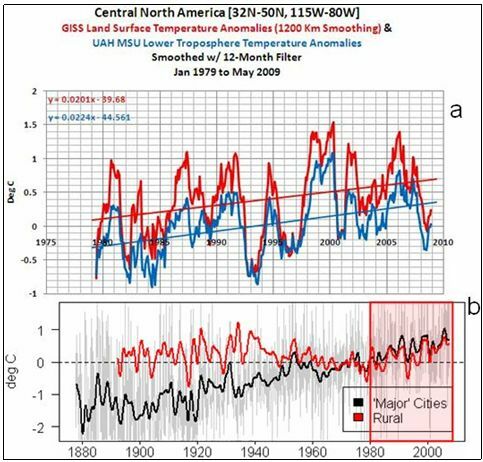 This may indicate that the warmer ground based land temperatures has a faulty added warm trend from UHI, adjustments and siting problems. 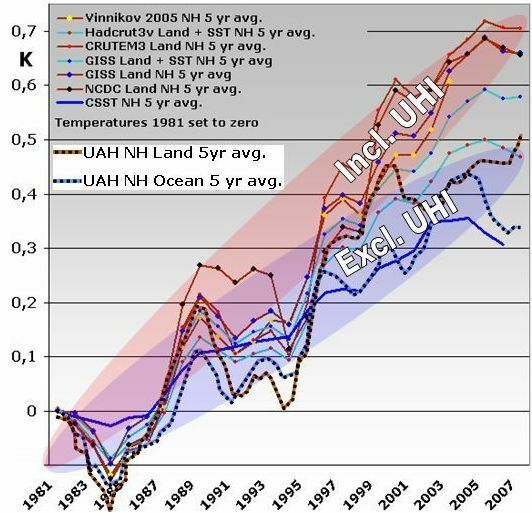 Further more, the long term resemblance between UAH-land and UAH-ocean appears logical and correct since temperatures over land and sea respectively should have a tendency to seek equilibrium at least on longer term. This further points to Ground the based land data type as the source of errors. Finally, this writing: It appears, that the UHI fraction in GISS ground based data is likely if we expect that UHI should be most significant in areas with high relative population growth. The rather good match between relative population growth and divergence between GISS and UAH TLT does in fact also a support to the general idea, that UHI plays an important role for the ground based temperatures often measure from cities and airports. Finally we must add, that many other factors than UHI can play a role – see for example “post scriptum B”. However, notice in fig 1 how the divergence between GISS groundbased data and UAH data just vanishes all together when we focus on an area with no UHI as McIntyres Peterson data suggests. This could indicate that UHI plays a role not that tiny for the descrepancy between UAH land data and Ground based land data. When speaking of “where not to measure UHI”, the absolute best spot in the world is London. Central Southern England is one of the areas of the world with highest population density which makes the area one big urban warmed area. In Southern central England, no matter from where the wind comes from it will come from a highly populated area, and thus there are no truly rural areas to test UHI with. 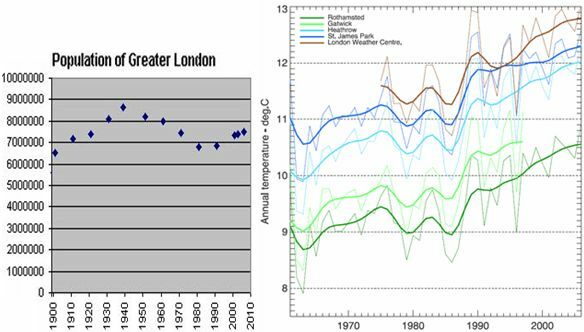 On top of this, ever since 1900, London has been a multi million population city, which is extraordinary. So, any attempt to measure UHI using London of all towns compared to a non rural surrounding area is a remarkable quest indeed. In Fig 2 above, I have inserted a “UHI”” mark in the north Atlantic. Obviously this is an example where UHI does not play a part in the difference between GISS and UAH. For the oceans, the GISS (LOTI) are hadcrut SST data sampled 2 meter under surface. In contrast, UAH mostly relects low Marine Air temperature, and these to different temperature sets are likely to induce some differences. In the period in question, the AMO current has sent stil warmer waters to the North Atlantic. My guess is that an event like a strong AMO rise in the North Atlantic might play a role. The AMO is know for warming up the air of the North Atlantic land and sea areas, and if the heat comes from the waters, the AMO current, then perhaps its not impossible that water temperature in the period is slightly warmer than the air? This is what it take if the warm AMO current is warming up the Northern atlantic land areas etc. Just a guess, obviously. I have taken the liberty to write “No UHI” on the maps for Australia. In fact Bob Tisdale got GISS to have lower warming trend than UAH TLT on his “Australia”. In my maps for relative population growth, I only have full countries, but Bob Tisdale chose a fraction of central Australia, not the whole Australia. but if we use all of Australia the GISS trend is much warmer. However im sure that world wide one could find many areas where the match between population and heat trends will be poorer than this due to a row of other factors.